Lucerne (; German: Luzern [luˈtsɛrn]; French: Lucerne [lysɛʁn]; Italian: Lucerna [luˈtʃɛrna]; Romansh: Lucerna; Lucerne Swiss-German: Lozärn) is a city in central Switzerland, in the German-speaking portion of the country. Lucerne is the capital of the canton of Lucerne and part of the district of the same name. With a population of about 81,057 people (as of 2013), Lucerne is the most populous town in Central Switzerland, and a nexus of economics, transportation, culture, and media of this region. The city's urban area consists of 17 municipalities and towns located in three different cantons with an overall population of about 250,000 people (as of 2007). 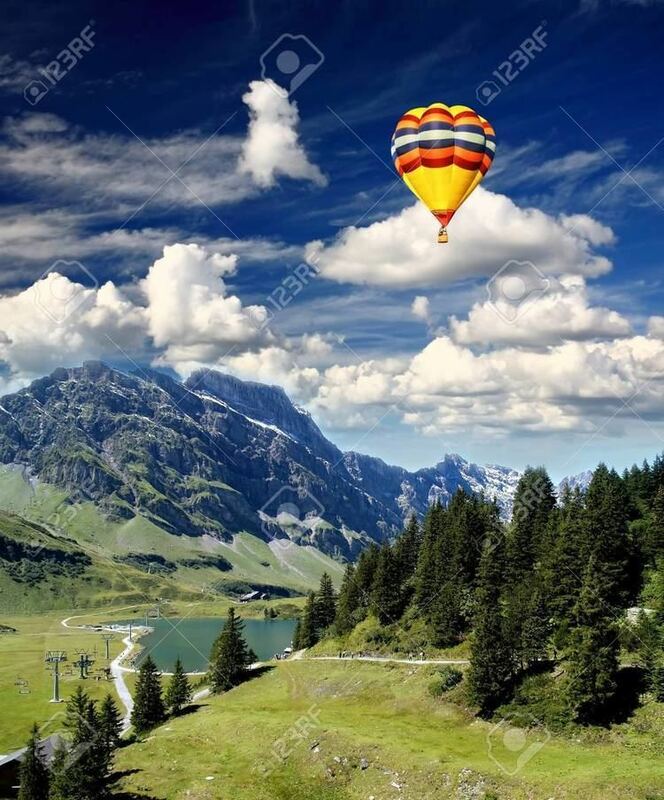 Owing to its location on the shores of Lake Lucerne (German: Vierwaldstättersee) and its outflow, the river Reuss, within sight of the mounts Pilatus and Rigi in the Swiss Alps, Lucerne has long been a destination for tourists. One of the city's famous landmarks is the Chapel Bridge (German: Kapellbrücke), a wooden bridge first erected in the 14th century. 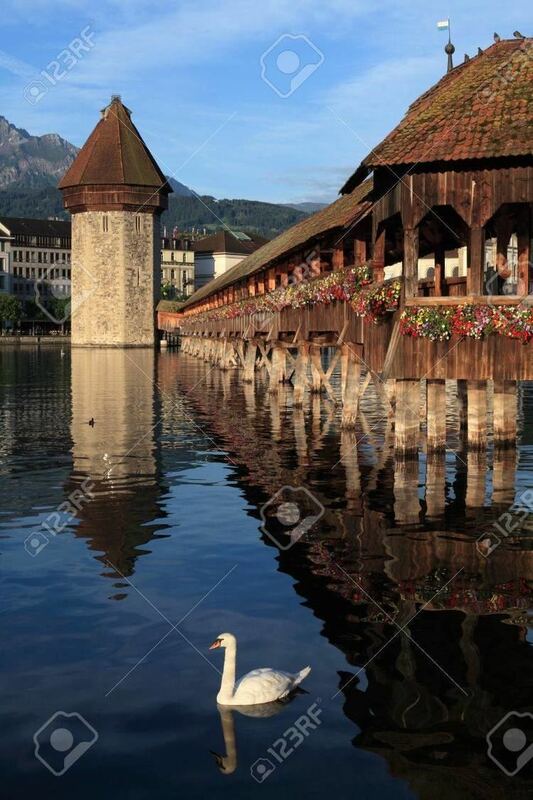 The official language of Lucerne is (the Swiss variety of Standard) German, but the main spoken language is the local variant of the Alemannic Swiss German dialect. After the fall of the Roman Empire beginning in the 6th century, Germanic Alemannic peoples increased their influence on this area of present-day Switzerland. Around 750 the Benedictine Monastery of St. Leodegar was founded, which was later acquired by Murbach Abbey in Alsace in the middle of the 9th century, and by this time the area had become known as Luciaria. In 1178 Lucerne acquired its independence from the jurisdiction of Murbach Abbey, and the founding of the city proper probably occurred that same year. The city gained importance as a strategically located gateway for the growing commerce from the Gotthard trade route. By 1290 Lucerne had become a self-sufficient city of reasonable size with about 3000 inhabitants. About this time King Rudolph I von Habsburg gained authority over the Monastery of St. Leodegar and its lands, including Lucerne. The populace was not content with the increasing Habsburg influence, and Lucerne allied with neighboring towns to seek independence from their rule. Along with Lucerne, the three other forest cantons of Uri, Schwyz and Unterwalden formed the "eternal" Swiss Confederacy, known as the Eidgenossenschaft, on November 7, 1332. Later the cities of Zürich, Zug and Bern joined the alliance. With the help of these additions, the rule of Austria over the area came to an end. The issue was settled by Lucerne’s victory over the Habsburgs in the Battle of Sempach in 1386. For Lucerne this victory ignited an era of expansion. The city shortly granted many rights to itself, rights which had been withheld by the Habsburgs until then. By this time the borders of Lucerne were approximately those of today. In 1415 Lucerne gained Reichsfreiheit from Emperor Sigismund and became a strong member of the Swiss confederacy. The city developed its infrastructure, raised taxes, and appointed its own local officials. The city’s population of 3000 dropped about 40% due to the Black Plague and several wars around 1350. In 1419 town records show the first witch trial against a male person. Among the growing towns of the confederacy, Lucerne was especially popular in attracting new residents. As the confederacy broke up during Reformation after 1520, most cities became Protestant, but Lucerne remained Catholic. After the victory of the Catholics over the Protestants in the Battle at Kappel in 1531, the Catholic towns dominated the confederacy. The future, however, belonged to the Protestant cities like Zürich, Bern and Basel, which defeated the Catholics in the 1712 Toggenburg War. The former prominent position of Lucerne in the confederacy was lost forever. In the 16th and 17th centuries, wars and epidemics became steadily less frequent and as a result the population of the country increased strongly. Lucerne was also involved in the Swiss peasant war of 1653. In 1798, nine years after the beginning of the French Revolution, the French army marched into Switzerland. The old confederacy collapsed and the government became democratic. The industrial revolution hit Lucerne rather late, and by 1860 only 1.7% of the population worked in industry, which was about a quarter of the national average at that time. Agriculture, which employed about 40% of the workers, was the main form of economic output in the canton. Nevertheless, industry was attracted to the city from areas around Lucerne. From 1850 to 1913, the population quadrupled and the flow of settlers increased. In 1856 trains first linked the city to Olten and Basel, then Zug and Zürich in 1864 and finally to the south in 1897. 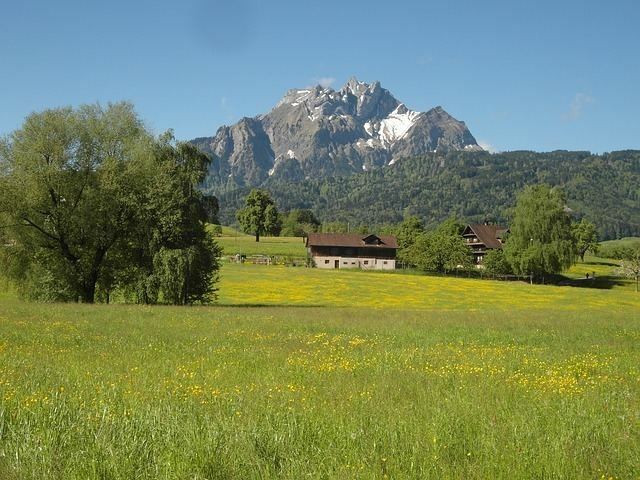 On June 17, 2007, voters of the city of Lucerne and the adjacent town of Littau agreed to a merger in a simultaneous referendum. This took effect on January 1, 2010. The new city, still called Lucerne, has a population of around 80,000 people, making it the seventh-largest city in Switzerland. The results of this referendum are expected to pave the way for negotiations with other nearby cities and towns in an effort to create a unified city-region, based on the results of a study. Lucerne has an area of 29.1 square kilometers (11.2 sq mi). Of this area As of 2009, 28.0% is used for agricultural purposes, while 22.3% is forested. Of the rest of the land, 47.6% is settled (buildings or roads) and the remainder (2.1%) is non-productive (rivers, glaciers or mountains). Before the merger, Littau had an area of 13.3 square kilometers (5.1 sq mi). Of this area, 52.3% is used for agricultural purposes, while 21.1% is forested. Of the rest of the land, 24.8% is settled (buildings or roads) and the remainder (1.7%) is non-productive (rivers, glaciers or mountains). In the 1997 land survey, 21.08% of the total land area was forested. Of the agricultural land, 49.17% is used for farming or pastures, while 3.16% is used for orchards or vine crops. Of the settled areas, 10.47% is covered with buildings, 4.29% is industrial, 1.96% is classed as special developments, 2.33% is parks or greenbelts and 5.8% is transportation infrastructure. Of the unproductive areas, 1.66% is unproductive flowing water (rivers) and 0.08% is other unproductive land. Between 1961 and 1990 Lucerne had an average of 138.1 days of rain per year and on average received 1,171 mm (46.1 in) of precipitation. The wettest month was June during which time Lucerne received an average of 153 mm (6.0 in) of rainfall. During this month there was rainfall for an average of 14.2 days. The driest month of the year was February with an average of 61 mm (2.4 in) of precipitation over 10.2 days. Climate in this area has mild differences between highs and lows, and there is adequate rainfall year-round. The Köppen Climate Classification subtype for this climate is "Cfb" (Marine West Coast Climate/Oceanic climate). The City Council (Stadtrat) constitutes the executive government of the city of Lucerne and operates as a collegiate authority. It is composed of five councilors (German: Stadtrat/-rätin), each presiding over a directorate (Direktion) comprising several departments and bureaus. The president of the executive department acts as mayor (Stadtpräsident). In the mandate period (Legislatur) September 2016 – August 2020 the City Council is presided by Stadtpräsident Beat Züsli. Departmental tasks, coordination measures and implementation of laws decreed by the Grand City Council are carried by the City Council. The regular election of the City Council by any inhabitant valid to vote is held every four years. Any resident of Lucerne allowed to vote can be elected as a member of the City Council. The delegates are selected by means of a system of Majorz. The mayor is elected as such as well by public election while the heads of the other directorates are assigned by the collegiate. As of September 2016, Luzern's City Council is made up of one representative of the SP (Social Democratic Party, who is also the mayor), and one each of CVP (Christian Democratic Party), GPS (Green Party), FDP (FDP.The Liberals), and glp (Green Liberal Party). The last regular election was held on 1 May/5 June 2016. Toni Göpfert (FDP) is Town Chronicler (Stadtschreiber) since 1990. The Grand City Council (Grosser Stadtrat) holds legislative power. It is made up of 48 members, with elections held every four years. The Grand City Council decrees regulations and by-laws that are executed by the City Council and the administration. The delegates are selected by means of a system of proportional representation. The sessions of the Grand City Council are public. Unlike members of the City Council, members of the Grand City Council are not politicians by profession, and they are paid a fee based on their attendance. Any resident of Luzern allowed to vote can be elected as a member of the Grand City Council. The parliament holds its meetings in the Rathaus (Town Hall) am Kornmarkt. The last regular election of the Grand City Council was held on 1 May 2016 for the mandate period (German: Legislatur) from September 2016 to August 2020. Currently the Grand City Council consist of 13 members of the Social Democratic Party (SP/PS) and one of its junior section, the JUSO, 9 The Liberals (FDP/PLR), 7 Christian Democratic People's Party (CVP/PDC), 7 Swiss People's Party (SVP/UDC), 6 Green Party (GPS/PES) and one of its junior section, the jg of Luzern, and 4 Green Liberal Party (GLP/PVL). In the 2015 election for the Swiss National Council the most popular party was the SPS which received 25.8% of the vote. The next five most popular parties were the SVP (19.5%), the FDP (15.4%), the CVP (14.1%), the GPS (13.3%), and the GLP (8.9%). In the federal election, a total of 26,521 voters were cast, and the voter turnout was 49.48%. Lucerne has a population (as of 31 December 2016) of 81,592. As of 2013, 19,264 or 25.0% of the population was made up of foreign nationals, of which 19.9% are from Europe, 2.8% from Asia, 1.2% from Africa and 1.0% from America. Over the last 10 years the population has grown at a rate of 1.2%. Most of the population (as of 2010) speak German (87%), with Italian, as well as Serbo-Croatian and English with 5% being second most common languages, followed by French and Albanian with 3%, and Portuguese and Spanish with 2% each. The age distribution in Lucerne is (as of 2013); 12,916 people or 15.7% of the population is 0–19 years old. 26,381 people or 33.8% are 20–39 years old, and 25,863 people or 32.1% are 40–64 years old. The senior population distribution is 10,530 people or 13.1% are 65–79 years old, 4,208 or 5.2% are 80–89 years old and 900 people or 1.1% of the population are 90+ years old. In Lucerne about 73.6% of the population (between age 25–64) have completed either non-mandatory upper secondary education or additional higher education (either university or a Fachhochschule). As of 2000 there are 30,586 households, of which 15,452 households (or about 50.5%) contain only a single individual. 853 or about 2.8% are large households, with at least five members. As of 2000 there were 5,707 inhabited buildings in the municipality, of which 4,050 were built only as housing, and 1,657 were mixed use buildings. There were 1,152 single family homes, 348 double family homes, and 2,550 multi-family homes in the municipality. Most homes were either two (787) or three (1,468) story structures. There were only 74 single story buildings and 1,721 four or more story buildings. The city grew up around Sankt Leodegar Abbey, founded in AD 840, and remained strongly Roman Catholic into the 21st century. By 1850, 96.9% of the population was Catholic, in 1900 it was 81.9% and in 1950 it was still 72.3%. In the 2000 census the religious membership of Lucerne was: 35,682 (60%) Roman Catholic, 9,227 (15.5%) Protestant, with an additional 1,979 (3.33%) who were of some other Christian denominations; 1,824 individuals (3.07% of the population) Muslim; 196 individuals (0.33% of the population) Jewish. Of the remainder, 1,073 (1.8%) individuals were another religion; 6,310 (10.61%) stated they do not belong to any organized religion; and 3,205 (5.39%) did not answer the question. Since the city straddles the Reuss where it drains the lake, it has a number of bridges. The most famous is the Chapel Bridge (Kapellbrücke), a 204 m (669 ft) long wooden covered bridge originally built in 1333, the oldest covered bridge in Europe, although much of it had to be replaced after a fire on 18 August 1993, allegedly caused by a discarded cigarette. Part way across, the bridge runs by the octagonal Water Tower (Wasserturm), a fortification from the 13th century. Inside the bridge are a series of paintings from the 17th century depicting events from Lucerne's history. The Bridge with its Tower is the city's most famous landmark. Downriver, between the Kasernenplatz and the Mühlenplatz, the Spreuer Bridge (Spreuerbrücke or Mühlenbrücke, Mill Bridge) zigzags across the Reuss. Constructed in 1408, it features a series of medieval-style 17th century plague paintings by Kaspar Meglinger (de) titled Dance of Death (Totentanzzyklus). The bridge has a small chapel in the middle that was added in 1568. Old Town Lucerne is mainly located just north of the Reuss, and still has several fine half-timber structures with painted fronts. Remnants of the old town walls exist on the hill above Lucerne, complete with eight tall watch towers. An additional gated tower sits at the base of the hill on the banks of the Reuss. The twin needle towers of the Church of St. Leodegar, which was named after the city's patron saint, sit on a small hill just above the lake front. Originally built in 735, the present structure was erected in 1633 in the late Renaissance style. However, the towers are surviving remnants of an earlier structure. The interior is richly decorated. The church is popularly called the Hofkirche (in German) and is known locally as the Hofchile (in Swiss-German). Bertel Thorvaldsen's famous carving of a dying lion (the Lion Monument, or Löwendenkmal) is found in a small park just off the Löwenplatz. The carving commemorates the hundreds of Swiss Guards who were massacred in 1792 during the French Revolution, when an armed mob stormed the Tuileries Palace in Paris. The Swiss Museum of Transport is a large and comprehensive museum exhibiting all forms of transport, including locomotives, automobiles, ships, and aircraft. It is to be found beside the lake in the northern-eastern section of the city. 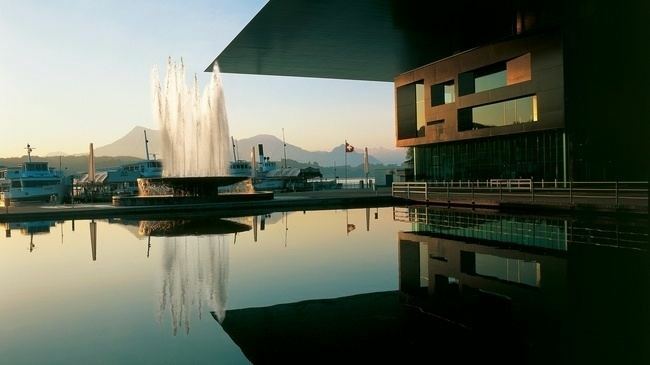 The Culture and Convention Center (KKL) beside the lake in the center of the city was designed by Jean Nouvel. The center has one of the world's leading concert halls, with acoustics by Russell Johnson. Since plans for the new culture and convention center arose in the late 1980s, Lucerne has found a balance between the so-called established culture and alternative culture. A consensus was reached that culminated in a culture compromise (Kulturkompromiss). The established culture comprises the Lucerne Culture and Congress Centre (KKL), the city theater (Luzerner Theater) and, in a broader sense, smaller establishments such as the Kleintheater, founded by comedian Emil Steinberger, a Lucerne native, or Stadtkeller, a music restaurant in the city's old town. 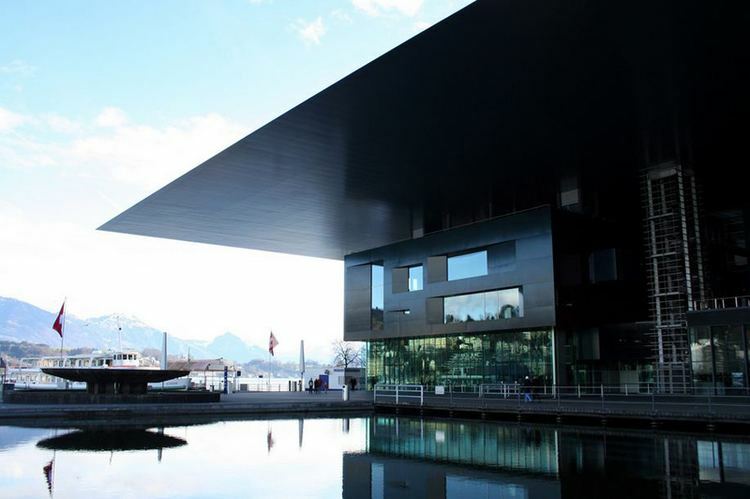 KKL houses a concert hall as well as the Museum of Art Lucerne (Kunstmuseum Luzern). Alternative culture took place mostly on the premises of a former tube factory, which became known as Boa. Other localities for alternative culture have since emerged in the same inner city area as Boa. Initially, Boa staged various plays, but concerts became more and more common; this new use of the building clashed with the development of apartment buildings on nearby lots of land. Due to possible noise pollution, Boa was closed and a replacement in a less heavily inhabited area is currently under construction. Critics claimed though that the new establishment would not meet the requirements for an alternative culture. Südpol is a center for performing arts in Lucerne presenting music-, dance- and theatre-events. The house at the foot of Pilatus is opened since November 2008. Lucerne is home to the Luzerner Sinfonieorchester, a category A symphonic orchestra, and to the 21st Century Symphony Orchestra, and they both hold most of their performances in the Lucerne Culture and Congress Centre. Lucerne is also home to Keramikkonzerte (http://keramikkonzerte.com/), a series of classical chamber music concerts held throughout each year. Every year, towards the end of winter, Fasnacht (Carnival) breaks out in the streets, alleyways and squares of the old town. This is a glittering outdoor party, where chaos and merriness reign and nothing is as it normally is. Strange characters in fantastic masks and costumes make their way through the alleyways, while Guggenmusiken (carnival bands) blow their instruments in joyful cacophony and thousands of bizarrely clad people sing and dance away the winter. The Lucerner Fasnacht, based on religious, Catholic backgrounds, starts every year on the Thursday before Aschermittwoch (Ash Wednesday) with a big bang at 5am called Morgenwacht (Morning Watch). There are big parades in the afternoon on Schmotzige Donnerstag (literally: Lardy Thursday) and the following Monday, called Güdismontag (literally: Paunch Monday), which attract tens of thousands of people. Lucerne's Carnival ends with a crowning finish on Güdisdienstag (literally: Paunch Tuesday) evening with the Monstercorso, a tremendous parade of Guggenmusiken, lights and lanterns with even a larger audience. Rather recently a fourth Fasnacht day has been introduced on the Saturday between the others Fasnacht days, the Rüüdige Samstag while mainly several indoor balls take place. From dusk till dawn on the evenings of Schmotzige Donnerstag, Güdismontag, and after the Monstercorso many bands wander through the historical part of the city playing typical Fasnacht tunes. Until midnight, the historical part of the city usually is packed with people participating. A large part of the audience are also dressed up in costumes, even a majority in the evenings. The city hosts various renowned festivals throughout the year. The Lucerne Festival for classical music takes place in the summer. Its orchestra, the Lucerne Festival Orchestra, is hand-picked from some of the finest instrumentalists in the world. In June yearly the pop music festival B-Sides takes place in Lucerne. In July, the Blue Balls Festival brings jazz, blues and punk music to the lake promenade and halls of the Culture and Convention Center. The Lucerne Blues Festival is another musical festival which usually takes place in November. Since spring 2004, Lucerne has hosted the Festival Rose d'Or for television entertainment. And in April, the well-established comics festival Fumetto attracts an international audience. Being the cultural center of a rather rural region, Lucerne regularly holds different folklore festivals, such as Lucerne Cheese Festival, held annually. In 2004, Lucerne was the focus of Swiss Wrestling fans when it had hosted the Swiss Wrestling and Alpine festival (Eidgenössisches Schwing- und Älplerfest), which takes place every three years in a different location. A national music festival (Eidgenössiches Musikfest) attracted marching bands from all parts of Switzerland in 2006. In summer 2008, the jodelling festival (Eidgenössisches Jodlerfest) is expected to have similar impact. Every year in June the B-Sides Festival takes place. B-Sides focuses on international acts in alternative music, indie rock, experimental rock and other cutting edge and left field artistic musical genres. The 2021 Winter Universiade will be hosted by Lucerne. As of 2012, there were a total of 77,641 people employed in the municipality. Of these, a total of 166 people worked in 53 businesses in the primary economic sector. The secondary sector employed 7,326 workers in 666 separate businesses. Finally, the tertiary sector provided 70,149 jobs in 6,929 businesses. In 2013 a total of 11.0% of the population received social assistance. As of 2000 51.7% of the population of the municipality were employed in some capacity. At the same time, women made up 47.9% of the workforce. Thanks to its continuous tax-cutting policies, Lucerne has become Switzerland's most business-friendly canton. As of 2012 Lucerne offers Switzerland's lowest corporate tax rate at cantonal level. Furthermore, Lucerne also offers very moderate personal income tax rates. In a recent published study of BAK Basel Economics taxation index 2012, Lucerne made it to the 4th place with an only marginally 2% higher tax rate compared to the top canton in this comparison. Since November 2009, Zürich Airport can be reached from Lucerne within 1 hour and 2 minutes by a direct (every hour) train connection every half an hour with a stop just below the airport, and within 40 minutes by car due to a direct motorway from Lucerne to the Airport, but only if you travel outside of rush hours. There are several football clubs throughout the city. The most successful one is FC Luzern which plays in Switzerland's premier league (Swiss Super League). The club plays its home matches at the new Swissporarena, with a capacity of 16,800. The city's main hockey team is the HC Luzern which plays in the Swiss Second League, the fourth tier of Swiss hockey. They play their home games in the 5,000-seat Swiss Life Arena. In the past, Lucerne also produced national successes in men's handball and women's volleyball and softball. Having a long tradition of equestrian sports, Lucerne has co-hosted CSIO Switzerland, an international equestrian show jumping event, until it left entirely for St. Gallen in 2006. Since then, the Lucerne Equestrian Masters replaced it. There is also an annual horse racing event, usually taking place in August. Lucerne annually hosts the final leg of the Rowing World Cup on Rotsee Lake, and has hosted numerous World Rowing Championships, among others the first ever in 1962. Lucerne was also bidding for the 2011 issue but failed. Lucerne hosts the annual Spitzen Leichtathletik Luzern Track and field meeting, which attracts world class athletes such as Yohan Blake and Valerie Adams. The city also provides facilities for ice-hockey, figure-skating, golf, swimming, basketball, rugby, skateboarding, climbing and more. Lucerne hosted FIVB Beach Volleyball World Tour event Lucerne Open 2015 and FIVB Beach Volleyball U21 World Championship in 2016. Lucerne boasts a developed and well-run transport network, with the main operator, Verkehrsbetriebe Luzern (VBL), running both the trolleybuses in Lucerne and a motor buses network in the city and to neighboring municipalities. Other operators, such as PostAuto Schweiz and Auto AG Rothenburg, provide bus services to other towns and villages. Lucerne railway station is one of Switzerland's principal railway stations situated in the middle of the town and just next to the lake, and enjoys excellent connection to the rest of Switzerland via railway services operated by Swiss Federal Railways (SBB CFF FFS) and the Zentralbahn (zb). Two other stations are located within the city boundaries, with Lucerne Allmend/Messe railway station close to the Swissporarena in the south of the city, and the Lucerne Verkehrshaus railway station adjacent to the Swiss Museum of Transport in the east. Lucerne's city transit system is fully integrated into the coherent and integrated fare network system called passepartout encompassing all kind of public transport in the cantons of Lucerne, Obwalden, and Nidwalden.